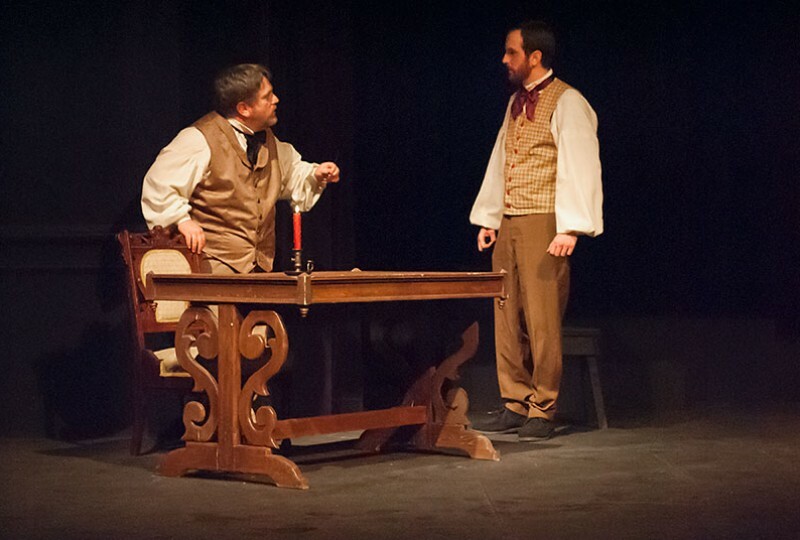 ESCANABA – Players de Noc’s theater production of Jacob Marley’s Christmas Carol follows the traditional yuletide tale but this is not the normal Charles Dickens holiday classic that you know so well. It was written in 1994 by Tom Mula. He wrote the story because he felt it was unfair that Jacob Marley did not share Scrooge’s chance at redemption. The play opened Friday at the Bonifas Fine Arts Center Theater. It runs tonight and Sunday afternoon and again next Thursday, Friday and Saturday. The four actors in the play take you through the familiar story from Marley’s perspective. As Scrooge goes through his revelation of what’s important in life, Marley struggles with his reality of the afterlife. Like Scrooge, Marley’s future has hope. Jon Johnson plays Marley. Johnson is not the cranky old miser that you would expect Marley to be like based on his image as a ghost mournfully moaning in Scrooge’s parlor. Johnson plays Marley as an agreeable sort who doesn’t quite understand why he is in the position that he is. Johnson does a great job making the audience feel empathy towards Marley. His humor is subtle as Marley stumbles with ways to redeem Scrooge’s soul. Guiding Marley through the process is a hell-sprite known as Bogle played by Kali Katarincic. Her acting is fun and mischievous as she plays the little spirit. It is obvious she falls for the hapless Marley as she attempts to keep him focused on his goal. Jim Powell plays Scrooge. 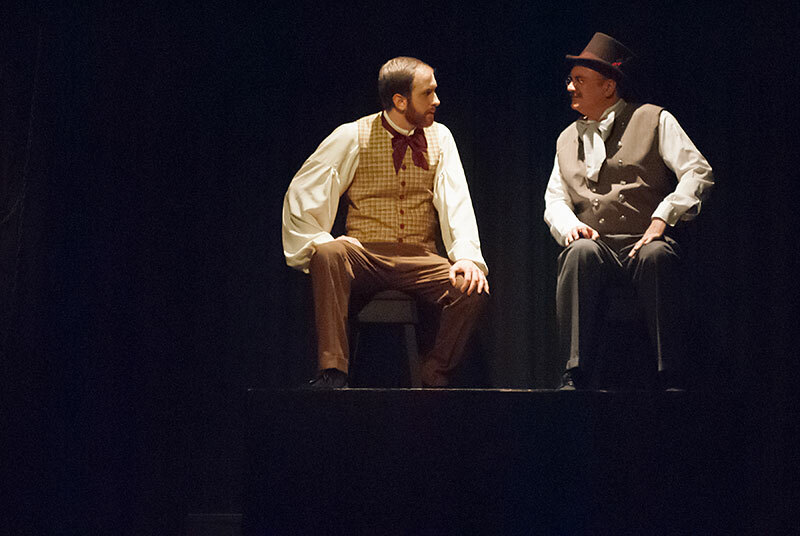 Powell portrays Scrooge as a whining penny-pincher with a bit of a humorous side. 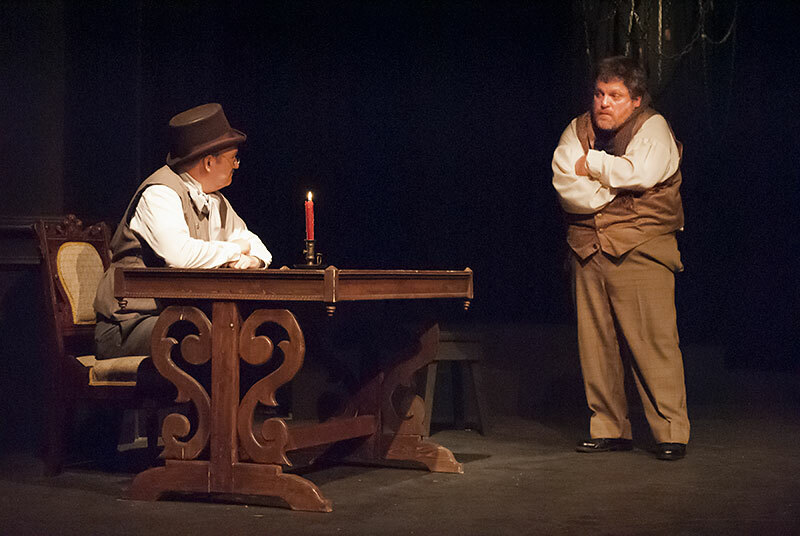 The scene with Powell and Johnson as they talk about Scrooge’s predicament is funny as both characters carefully feel their way through what might happen next. Mark Cowman is a great comedic actor. He plays eight parts in the play from Bob Cratchit to Marley’s father. But my favorite part is the Record Keeper. Cowman is awesome as a cranky old man who you can tell does care for Marley’s plight. The set is minimal but there is nothing simple about the staging. The characters move about freely on a sparse stage taking you from one scene to another. Not an easy thing to pull off. 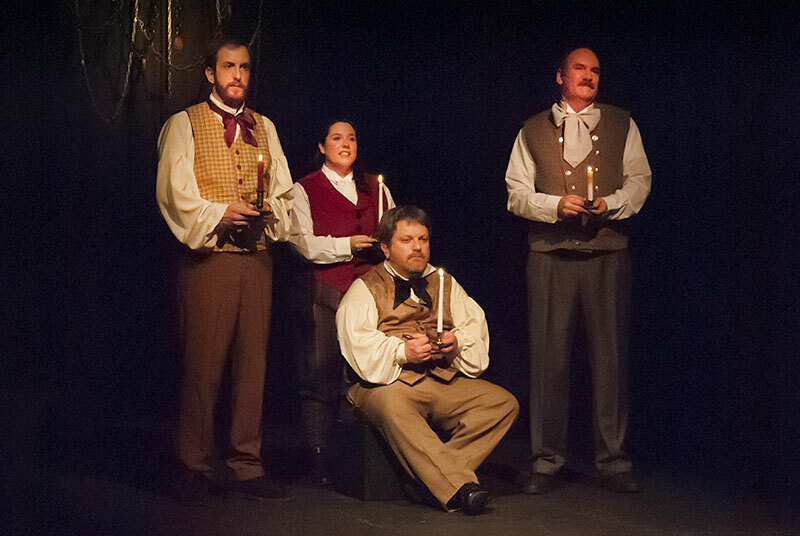 They are aided by lighting designed by Jim Soderberg and executed by Patty Woerpel and Howard Smale. 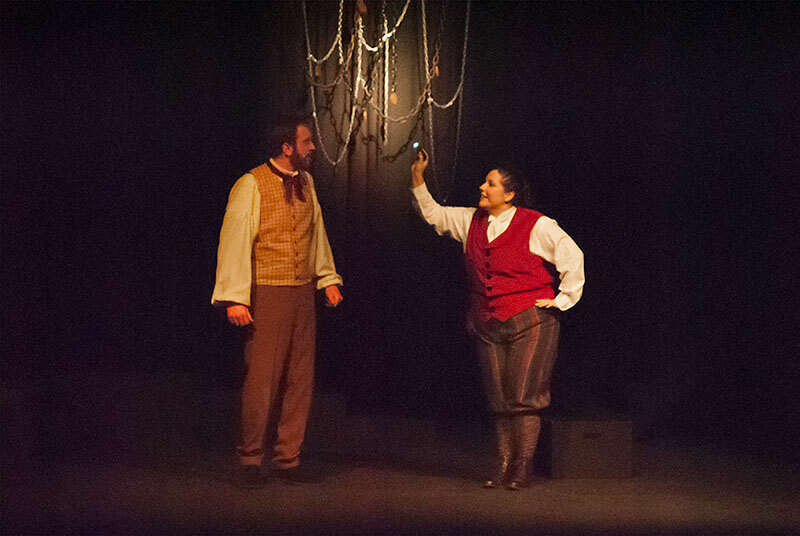 There are 116 lighting changes in the play. They help move the actors effortless through scenes left more to the audience’s imitation. An odd thing about this play is that it is narrated by the actors themselves. They constantly move from telling you the story to acting the part as the play unfolds. It works and even at times is funny as the characters comment on their own actions. Jacob Marley’s Christmas Carol is directed by Pete Dzanbozoff. He is an experienced director with Players de Noc and an accomplished actor himself. He says he immediately fell in love with the script when a former Players member brought it to his attention. The rest of the crew includes Patty Woerpel, production stage manager; Kayla Blunt, back stage manager; Matt Norby, properties and house manager; Pat Feldhusen and Jamie Peterson, sound; Jolie Dzanbozoff, custom design; Heather Grimes, hair and makeup and Kate Oman, sign board. Jacob Marley’s Christmas Carol is a delightful twist to an old classic. It’s fun and renews your confidence in humankind during the holiday season. Tickets are available online at www.playersdenoc.org or at the Bonifas. 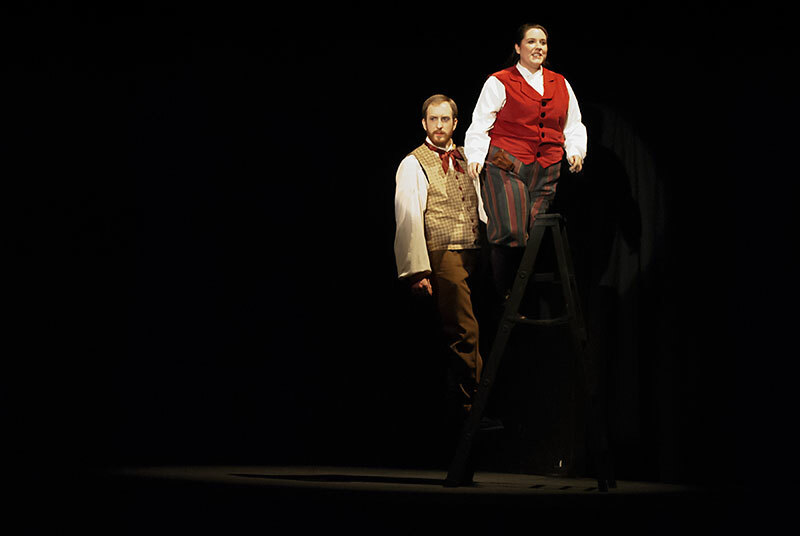 Share the post "Players de Noc play is delightful twist to an old classic"